Spring is here (even here in Alaska) and thoughts turn to outdoor barbeques and camping. 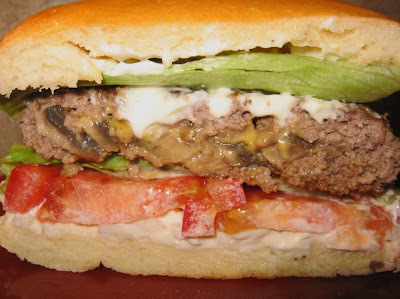 I’m always on the lookout for easy recipes that will “hold up” well in the cooler and Mushroom Stuffed Hamburgers is a good one. You can make the patties ahead of time and freeze them solid (which will help insure food safety while you travel.) Just throw these frozen patties on the grill and pair them with homemade hamburger buns (recipe follows) and you have a delicious cookout! Each of these hamburgers is made out of two thin patties with mushrooms and cheese sandwiched in between. So mix everything (except the mushrooms & cheese) and make 8 thin patties. Top four of the patties with sautéed mushrooms and your favorite cheese and then a 2nd thin patty, pressing to seal the edges well. Repeat for the other three hamburgers. If you are going to freeze these, wrap each one individually in plastic wrap and lay them flat on a cookie sheet to freeze. When they are frozen, you can stack them in a freezer Ziploc bag. Whether you are taking these on a camping trip or just leaving them in the freezer for a quick weeknight meal, they taste great. 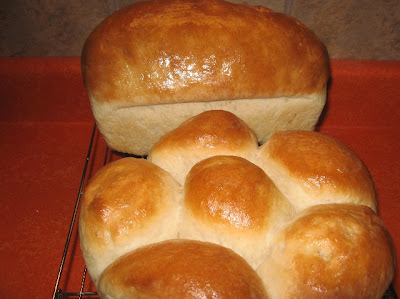 This recipe will make at least 2 dozen hamburger buns. Once baked, they freeze extremely well. I find myself using them for everything from breakfast sandwiches to peanut butter sandwiches. In an electric stand mixer, place 2 cups of flour, yeast, sugar, oil and salt (stir to combine dry ingredients) Add 2 ½ cups of very warm water (see note). Stir quickly while you add the water. Let this mixture sit for about 10 minutes. Add the rest of the flour, about ½ cup at a time, scraping the sides of your bowl and dough hook each time. Every time you stop your mixer, turn all of the dough mass over. Let your machine knead this dough until it CLEANLY comes away from the side of your mixer. If you have added all 5 cups of flour and it has not come cleanly away from your bowl, you need to add just a little more flour. Once the dough comes cleanly away from the sides of your bowl, let the machine knead it for about five more minutes. Remove the dough and grease the bowl. Return the bread to the greased bowl and grease the top of the dough. Cover the dough with plastic wrap and let it rise for an hour (it will more than double in volume). Punch the air out of your dough and let it rest (covered) for 15-20 minutes. This step is important because your dough will “behave” much better while you form it, if you follow this step. Pinch off pieces of dough about the size of a tangerine. Make each ball as round as you can. Roll each ball into a 5” circle. Resist the temptation to add more dough to make a thicker bun. At this stage, your buns need to be a lot thinner than you think. (about ½” thick). If you add more dough, you are going to end up with a burger bun the size of your face! Place the formed buns on a greased baking sheet and spritz the top of the dough with just a little cooking spray. Cover with plastic wrap and let rise for about 45 minutes. Bake at 400° for 15-16 minutes. 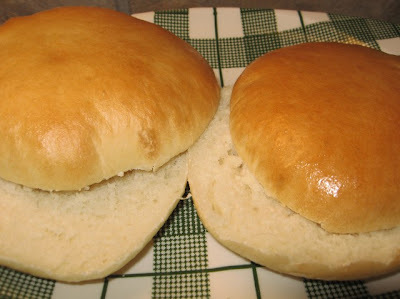 If you are going to freeze these buns, let them cool completely first and freeze as soon as possible. About 4 to 5 minutes in a 350° oven will heat a frozen burger bun and make it taste like it was just baked.